It's a simplified graphic - Frank was barely involved in the Jodorowsky attempt. Hell, they didn't even mention Ridley's Dune attempt (which Frank was slightly more involved with) following Alien (despite showing the willyworm art). Speaking of Jodorowsky, what has become of the documentary detailing the filled film attempt? It was mentioned that it was shown as Cannes film festival, but when will it be released on DVD. DuneFishUK wrote: It's a simplified graphic - Frank was barely involved in the Jodorowsky attempt. I agree, Jodorowsky would have just pissed me off. I'm sure it would have been even more trippy than Lynch, too. It wouldn't have been Dune... but it would have been monumentally awesome. Let's face it, it couldn't be worse than what's been done to Dune by the Hack. And also, there is a major difference, Jodorowsky is a genius so if we don't understand it's us not him. When we don't understand the UltraSmug it's because he makes no sense. It´s impossible to make a good Dune movie, because the book can´t fit in 2 hours. And to be honest, a 3 part Dune film sounds incredible tedious. I think a tv show would be much appropiate. The existing one was pretty good in respecting the story, but Lynch did capture the visuals best imo. I guess a mix between the two would have been perfect. I reckon a good animated series is the way to go, it'd allow for a series format while giving some leeway for special effects, voice overs and the likes. I guess I should go and see Prometheus. A friend of mine went and said she liked it but she was worried she forgot most of the Alien storylines. Was it here I read you actually didn't need to remember them and that it was better seen as a stand alone ? I really should go and see it. The film began development in the early 2000s as a fifth entry in the Alien franchise, with both Scott and director James Cameron developing ideas for a film that would serve as a prequel to Scott's 1979 science fiction horror film Alien. By 2003, the project was sidelined by the development of Alien vs. Predator, and remained dormant until 2009 when Scott again showed interest. A script by Spaihts acted as a prequel to the events of the Alien films, but Scott opted for a different direction to avoid repeating cues from those films. In late 2010, he brought Lindelof onto the project to rewrite Spaihts' script, and together they developed a separate story that precedes the story of Alien but is not directly connected to that franchise. According to Scott, though the film shares "strands of Alien's DNA, so to speak", and takes place in the same universe, Prometheus explores its own mythology and ideas. I just copy & pasted the link without tags around it... lazy. my desk was ruffled by workers over the week end, so I'm easily confused today. I found Prometheus to be pretty disappointing. The plot doesn't make much sense and the scientists... are not the brightest bunch of the lot. I didn't find it suspenseful except for one scene involving Noomi (you'll know the scene without me describing it). After you watch the movie, check out this link (http://shar.es/swRX0). Sums the movie up quite nicely. I couldn't resist and I read it anyway. I heard all the same stuff. I still might go see it at a $5 matinee. I like cheap movies. 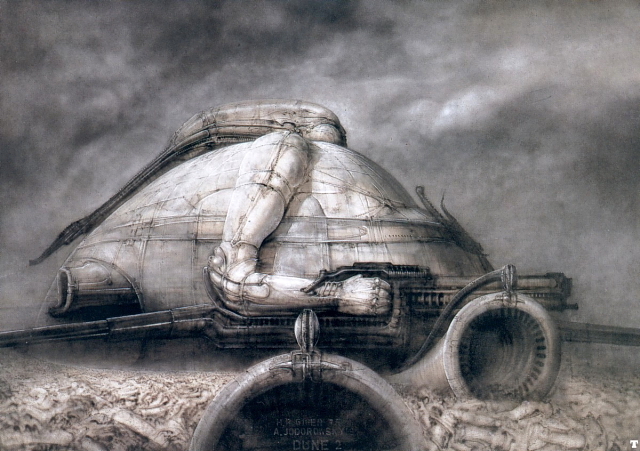 Fun fact: You remember the Baron Harkonnen fortress which Giger drew which was based upon the Baron's own image? Well, it's reused as the Pyramid (sort of) in PROMETHEUS which houses the primordial bacterial pre-facehugger/pre-xenomorph parasites. A bit of an ode to Giger's pre-ALIEN artwork, I should say. I still would like to see Jodorowsky's DUNE developed as an interactive movie for computers. Really ?! I can't believe it ! 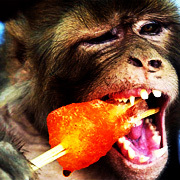 Woww !